Deer hunting is one sport or activity of pursuing deer. This classic outdoor sport that was introduced as early as 7,000 BC has been loved by outdoor enthusiasts all over the world. Deer hunting isn’t just a simple sport. It entails a lot of patience and hard work to have a successful deer hunting activity. Practice, practice, and more practice is needed before you go out deer hunting during hunting season. It is important then that you know the basics of deer hunting. 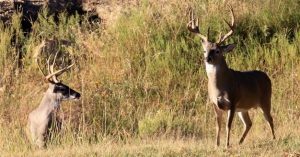 Although there are a lot of things that you should know and prepare for any deer hunting activities, there are only three major things that you should focus on: the rut, the deer rubs, and the deer scrapes. This is the mating season for white tail deer. This is normally the time when deer are more active but less cautious than usual, which makes them susceptible to motorists and deer hunters. It is also during this season when vehicle accidents that involve deer are relatively higher. The rut is the best time for deer hunters to move. Bucks during this time are constantly on the move in search for a doe. Most of the time, does play hard-to-get, leading bucks into a wild goose chase before finally mating. Once you see a doe, expect to see a trailing buck behind. Always be alert and ready. Who knows, your mature back may be just around the corner. These are created when bucks (male deer) rub their antlers and their foreheads against the base of a tree. This normally happens during late summer or early fall. During rut seasons, rubs are normally done by territory. The gland of the bucks forehead leaves a distinct scent so other deer will know who did the rub. Rubs are very easy to find. During your deer hunting, look for fresh deer rubs as they are a indication that a deer is within the territory. But be careful not to touch the rub nor leave any human scent around the vicinity. These are scrapes found on the ground where deer normally paw the soil away using their hooves. Deer scrapes vary in sizes, ranging from one to eight feet. When you are out deer hunting, see that you check for deer scrapes in your area. That is a clear indication that a deer might be somewhere near you. For any hunting expedition, your safety should be your top concern. There are a number of recorded injuries or even deaths every year involving deer hunting. Here are some few safety tips that might help you a lot. Remember to always keep your gun pointed in a safe direction. This is the number one rule of gun safety. A safe direction basically means that your gun is pointed in a certain direction so that even if the gun unexpectedly goes off, it won’t cause any damage or injury. The second thing to remember is to keep your fingers away from the trigger until you are ready to shoot. When you are holding a gun, rest your finger on the trigger. Never touch the trigger until you are actually ready to fire. The last thing to consider is to keep the gun unloaded until it is ready to use. Engage the safety pin if possible every time you pick up the gun. A deer hunter can take advantage if he is on an elevated position. To achieve this, using a tree stand is a great help. However, if not properly used, tree stands can actually cause serious injuries or even deaths. To avoid this, start by getting familiar with your equipment. Read the recommended procedures that concern your tree stand. Also, never forget to use your safety equipment such as the safety harness. When you are climbing, refrain from carrying any equipment. Instead, use a haul line in raising or lowering your gear. To get prepared for your next deer hunting activity, make sure that you know the basics and the safety measures of this classic outdoor sport.